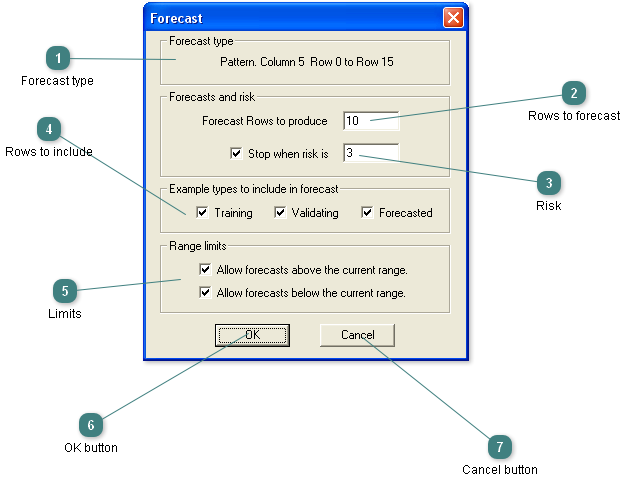 The Forecast dialog is used to forecast the values of any serial mode columns. The two main types of forecast. Only Serial columns can be used to produce forecasts. Swing. Includes the number of rows and forecast period. Pattern. Includes the range of the pattern found. Enter the maximum number of rows to forecast. Enter the maximum acceptable risk level for the forecasts. SwingNN may go beyond this level as it tries to reduce the risk. Check all the row types to include in the forecast. Check to allow the forecasted values to go above or below the limits of the current range.